Where would various types of foods be without it? For anyone who loves to cook, olive oil is something that is always present in condiment racks. With olive oil, you will receive a broad range of benefits from your food. Olive oil alone does not just act as an oil in order to cook food better, but it can also be a seasoning in order to further enhance the flavors of your food. Moreover, olive oil is also THE healthy options amongst other types of oil. Olive oils are known to offer the body various health benefits and help reduce a wide variety of health issues like cholesterol and heart problems. Unfortunately, olive oil comes in a bottle, sometimes without clean sprays or pourers so you might need to always have tissue on standby to wipe wasted precious olive oils drips on the bottle or on the stove and countertop. Also, you might have difficulty in regulating or controlling the amount of oil you are going to use. And if you are ever conscious about your kitchen decors, then you can’t just settle for a meh looking bottles. No, my dear. That just won’t do! Serious cooks always make improvements. The best olive oil dispenser out there can make your cooking life easier while looking like they belong to a gorgeous cooking show set. All of them do not only work with olive oil but can handle every other liquid type such as vinegar and sunflower oil as well. Like a swiss army knife, olive oil has many applications— in cooking and outside the kitchen realm. If you are confident and brave enough to experiment, you will find that olive oil is very versatile. Olive oil is commonly used on salads, whether it is used in a dressing or drizzled on top of your salad in order to enhance the flavor. This oil is good enough to enhance the taste of most foods so it can be used to drizzle on top of cooked pasta and vegetables without spoiling anything. Olive oil is also used when frying since its smoking point is higher than other oils out there. When oil reaches its smoking point, it is immediately ruined, meaning it starts to lose its flavor. So, you need to make sure to use an oil that can take the heat in order to have more flavor on your food. Olive oil can also be used in soups and baking bread and goods. Instead of adding heavy cream to soup, you can use olive oil to add flavor with a good dose of antioxidants and monounsaturated fats. You may not know this, but olive oil works magically with fruit-based cupcakes or chocolate baked goods. It makes the mixing much easier and adding a new level of the flavor. The uses of olive oil do not just end in the kitchen alone. Hair, nails, skin, polishing and treating or reducing the effects of certain health problems are only some of the common applications of olive oils outside the kitchen. Dispensers are designed to store and serve, thus oil dispenser helps in dispensing oil or any other type of liquid without any mess. For an olive oil dispenser, there are basically 2 types: A cruet or pourer and a sprayer. Also known as a caster, a cruet is a vessel or bottle with a narrow neck. Cruets usually have an integral spout or lip in order to control or regulate the flow of liquid and prevent spilling or accidental drips on the bottle or on the countertop. Olive oil cruets are best used when pouring oil to pans or drizzling to foods without worrying about greasy drip mess on the side of the bottle. Just like a cruet, olive oil sprayer is also a bottle or vessel. However, instead of a narrow neck, this dispenser has a spray head for dispensing. Usually, there is a button or a long handle that you need to press or pull in order to spray the liquid inside. Olive oil sprayers or misters are best used when you want an even coat of olive oil on salads without mixing as well as adding olive oil on barbecue pieces. Size is an important factor you need to look out for when looking for the best olive oil dispenser. Once opened, olives oils are only at their best for the next 2 months. So if you only cook for your family, then you do not want a large bottle that takes a long time to empty out. If you have a restaurant or is in constant need of olive oil, then, in this case, you can opt for bigger bottles for convenience. Also, keep in mind that the bigger the bottle is, the more it is difficult to handle with one hand, so you might want to avoid a bad situation there. 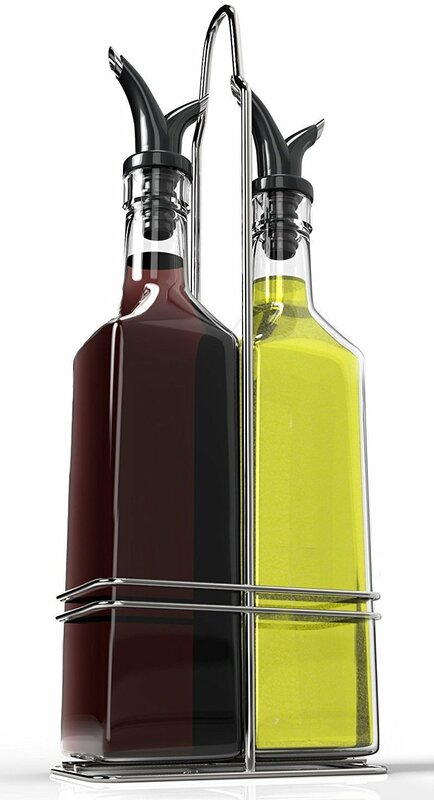 When choosing the best olive oil dispenser, naturally you want glass. Although there are other types of material you can choose from, glass can provide you with elegance and beauty that will suit any kitchen aesthetics. Also, you need to keep in mind that olive oil dispenser bottles come in various levels of thickness. You might want to choose a thicker glass for olive oil and preferably darkened, too. This is because olive oils are best stored in coll and dark areas. Too much exposure to heat and light can cause olive oils to go rancid and reduces its lifespan. Ideally, you can choose other material types you wish as long as it is durable. Non-transparent materials keep olive oil safe from light and therefore superior, that is if we ignore all other factors. Cleaning oil spills is never an easy job. And every time you run out of olive oil, any dispenser needs to be cleaned first before refilling. This is to ensure that cleanliness of the dispenser and the consistency of the next olive oil are maintained. For instance, if you choose to change your brand of olive oil, you can’t just add or refill it to the dispenser since both brands will mix up with each other. This results in the inconsistency of the oil and the very thing it will affect will be the quality of its flavor. When choosing the best olive oil dispenser, find one that is very easy to clean. Better yet, choose an olive oil dispenser with removable parts and is dishwasher safe. Ultimately, you need to choose an olive oil dispenser that is not only well-designed but is also very easy to use. You should cross out an olive oil dispenser with features such as unbearable caps, slippery materials and hard to reach handles. Pick a unit that you can use easily and comfortably. When cooking, nothing is more frustrating than having oil drip down the bottle and onto the floor, countertop, and stove. It adds an extra chose to your routine and clearly messes your cooking rhythm. When you want an olive oil cruet, you need to find one with a super thin spout in order to reduce the risk of spilling while you have the control over the amount of oil you pour. There is also other olive oil cruets that have a lid on the spout. This can help greatly in stopping the flow of oil and prevent oil drips, thus less waste and less mess. Also, spout covers help keep small insects from getting inside the bottle. For olive oil sprayers or misters, you need to choose one with a consistent spray pattern. This is an important factor in order to avoid blobs of olive oil in your food or on your skillet. Basically, there are 2 types of spray commonly offered. The first one is a pressure-pump cap sprayer and the other is a trigger-pull sprayer. Also, there are some sprayers with anti-clog mechanisms in order to keep the dispenser cleaner. Now that you know certain factors you need to consider when looking for an olive oil dispenser, with hundreds of units available, choosing the best can still be a hard task. Don’t you worry though, I have here a list of the top picks for the best olive oil dispenser on the market today. The Tablecraft Oil and Vinegar Cruet comes with a nice, thin spout in order to prevent any spills and helps you measure pours precisely and easily. It has a manageable size of 16 oz. for easier storage while allowing you to prepare a considerable amount of olive oil for future use. This glass bottle has a pleasant green tint that somehow makes whatever you pour in the bottle looks more appetizing. 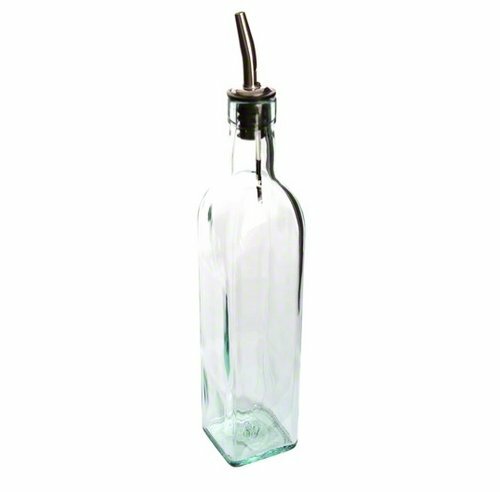 Also, this bottle creates a classy and elegant look for serving vinegar and oils that add aesthetics to your kitchen area. In the realm of kitchen appliances and gadgets, Misto is a brand that needs a very little introduction. Browsing through an online kitchenware shop or visiting any decent kitchen store, you could never miss the name. 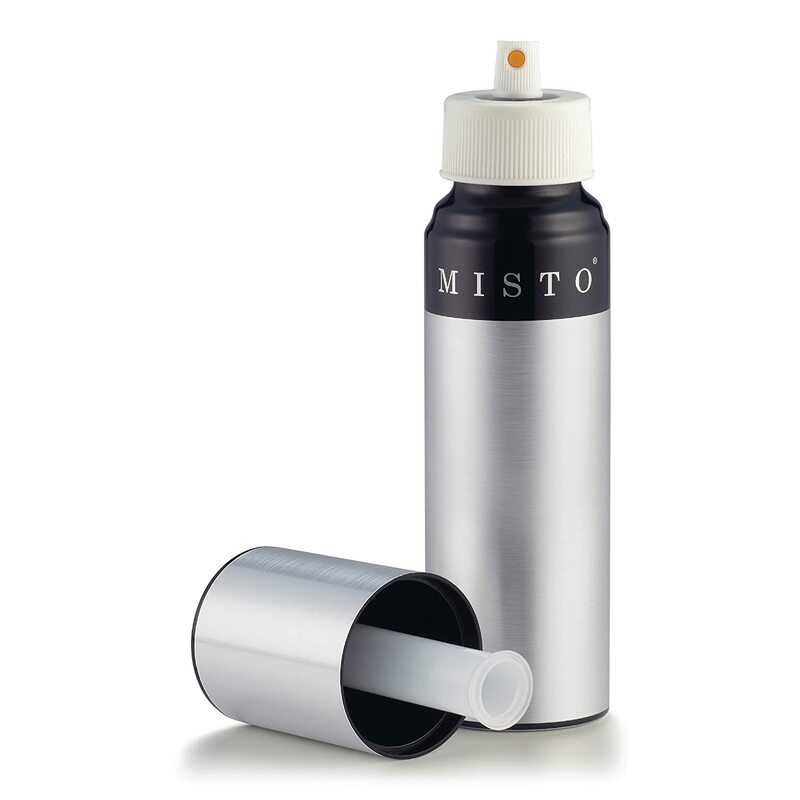 So it is safe to say that Misto is one of the go-to oil brand names for anyone who is interested in buying olive oil dispenser. With a genuine aluminum piece, this olive oil sprayer has a very sturdy build yet so very lightweight. What’s more is that it fits elegantly to any kitchen décor and aesthetic you have— it is very streamlined, yet eye-pleasing. The performance if this olive oil sprayer is on par with its look. It delivers a consistent mist of olive oil and has a reasonably powerful sprayer. Yes, the unit might be big, however, it is still manageable. However, it does have some points that bother me. First is that it cannot be fully-filled with oil which pretty much kills its ample size. Second, you need to pump the cap for 10 to 15 times in order to create pressure before you can actually spray olive oil. Still, that’s what you get for an eco-friendly price and it still provides superb performance. The Evo Oil Sprayer is entitled as the first non-aerosol sprayer there is. Because of its distinctive fan-shaped oil spray, it can easily dispense olive oil without any chemicals, harmful additives and propellants. With a generous 18 ounce capacity, you are ensured to have enough oil that is always ready for cooking or adding the final touches on your meals. Every pull on the trigger of this oil sprayer, you will get a precise 1.35 mm in a fan pattern that helps covers more cooking surface with less olive oil. The trigger is scallop design for a secure and naturally comfortable grip. You get a handy screw-on funnel which hooks onto the handle of the oil sprayer in between uses so you can easily refill or change its contents. Also, this oil sprayer is made of durable plastic that is Latex-free, DEHP-free, and BPA-free so it safe to use on food and is 100% recyclable. For more convenient labeling, it also comes with 3 reusable label bands. Lastly, it is dishwasher safe for ease of cleaning. This olive oil sprayer from Ripe US is made of stainless steel which is food grade that are completely eco-friendly and BPA-free making it durable and less likely to slide with its advanced designs. This olive oil sprayer is not limited to olive oil, you can also fill it soy sauce, vinegar lime or lemon juice, marsala wine or sherry and can be widely used for salad making, baking, cooking, roasting, frying, grilling and more. This olive oil sprayer is very easy to use with a simple pumping action to produce fine mist and allows you to have an even spraying and ultimate control on the amount of oil used. If it becomes empty, you can easily clean it by unscrewing the lid and rinsing the unit with warm water and soap. 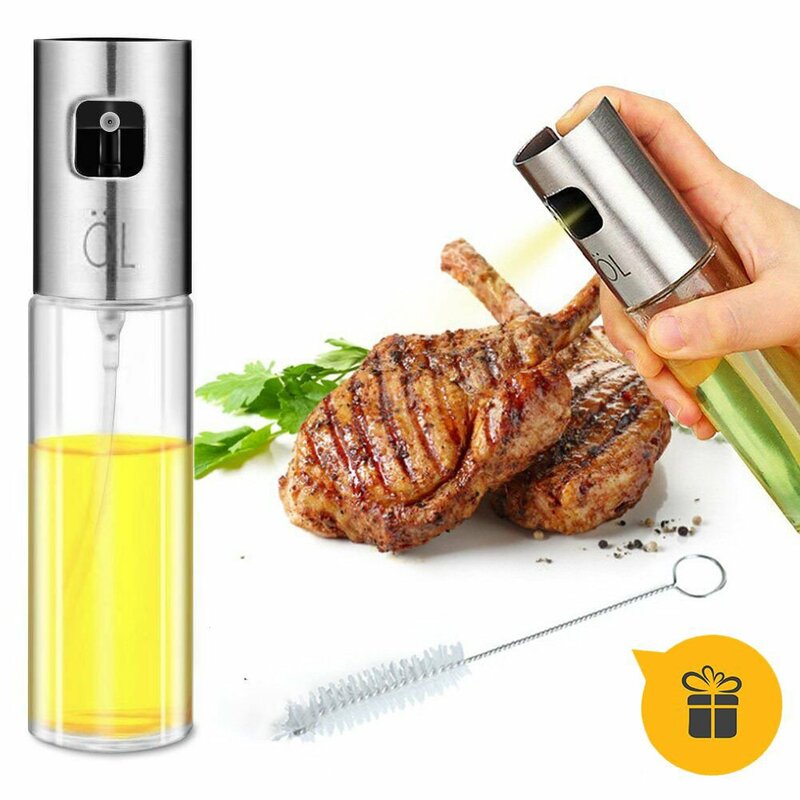 This olive oil sprayer offer portability. Because of its perfect and manageable size, you can use it in your kitchen or easily pack it and carry it outside for junket or a picnic. This unit comes with one free brush for easier cleaning. In case you have any problems or issues with this product, they offer you a refund or replacement that will be processed within 24 hours. Because of its dual spout gimmick, this 2-bottle dispenser set takes a special edge over other competitors. Basically, this product from Royal has 2 spouts per bottle, a thin one for precise drizzling and a thicker one for a more heavier pour. It has a bottle capacity of 17 ounces, times two since you have 2 bottles which give you a lot of value without spending a lot of money. Unless it is for restaurant kitchen use, you are most likely never going to fill both bottles. Because you have one bottle with a wider spout, you can sauce with chunks without worrying about clogging. While the clear glass looks classy, it does nothing on keeping the lights out. So do not expect the oil to be the best in forever. In order to keep the oils fresh, you might need to consider storing them to coll and dark places. Moreover, the spout has no cover so you need to look for a way to close the spouts of small insects might get inside. 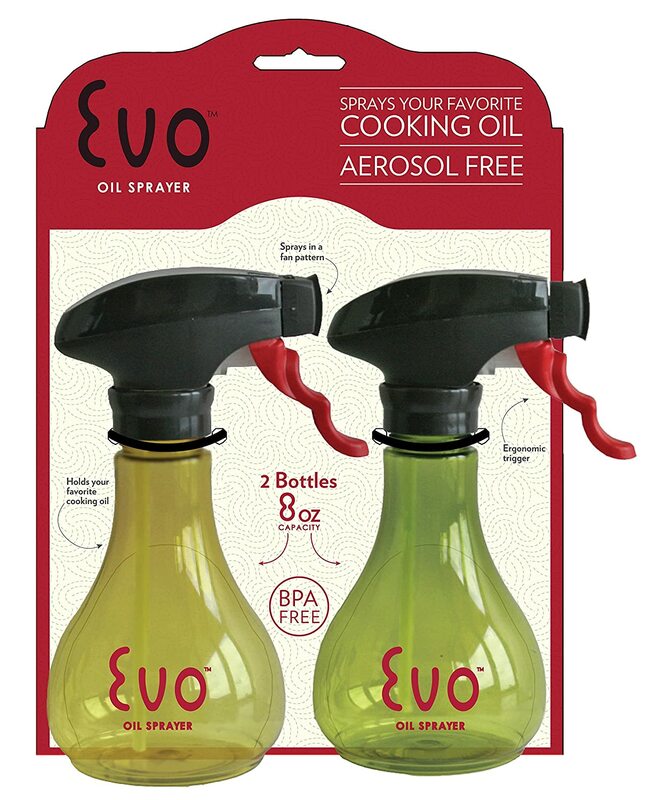 Although all of the olive oil dispensers that I have mentioned above are great, if I would choose the best of the best, then it would be the…Evo Oil Non-Aerosol Oil Sprayer! The very first reason is because of its non-aerosol title, meaning it is completely safe for food use. Also, it has a solid performance that delivers even mist coatings of oils and great control of oils used. Lastly, is because it is dishwasher safe for easy cleaning. Although it may be lacking in aesthetics and elegance, this olive oil sprayer provides the service it is designed to do. Olive oil is a must-have ingredient in the kitchen. These oils are too precious to allow spilling and dripping all over your floor, stoves, and countertop. So, you need to get yourself the best olive oil dispenser that can help you prevent extra chores of cleaning spills and drips of olive oils and allows you to precisely measure the amount of oil you pour which can be really helpful to newbies. I hope this article helped shed some light on some of the best olive oil dispenser available on the market. If you have any questions or suggestions, feel free to fire up the comment section below. Until then, have fun dripping! PreviousPrevious post:Can You Freeze Jello? Should You Do It? NextNext post:How Long Does Spaghetti Last In the Fridge?